My little toes longed to be free. 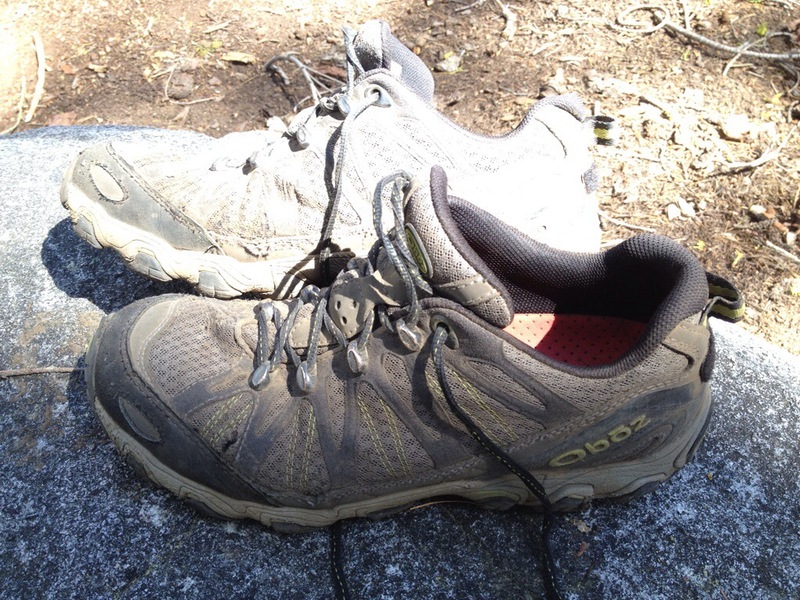 They had been fighting against the newest oppressive regime (my Oboz trail shoes) in silence for some unknown period of time but they would be silent no more. No More!!! “Ow!” I frowned… I recognized the sharp pain radiating from the two littlest toes of my right foot and I couldn’t help but hope that they would just give up and go numb… That would happen eventually, but it wasn’t a good thing. In the silent war between my toes and my shoes, my toes were making slow and steady progress… They were ripping out the seams and wearing through the fabric on both sides of both shoes as the little toes and big toes of each foot tried to break free. The shoes retaliated, causing blisters and callouses to form on the outside edges of my big toes, which I mostly ignored. My little toes, however, had a much more effective strategy for getting my attention… No blisters for them… They went straight for the nerve, “just try to ignore this!” they shouted. 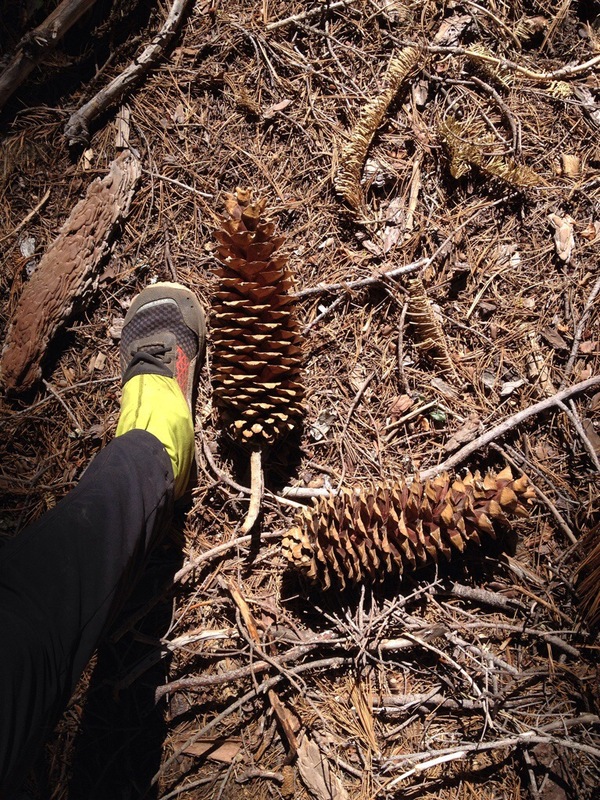 It was a Morton’s neuroma… It had happened on the Appalachian Trail as well (after just 300 miles) but I didn’t know what it was then… I only knew that it hurt so much that it made me want to curl up and cry on the side of the trail. After I finished the AT, the neuroma on the left-side had gotten even worse, perhaps aggravated by running the Marine Corps Marathon. It didn’t stop screaming until I got custom orthotics and three cortisone shots. I was lucky that I’d gotten through the first 1000 miles of the PCT without any real foot issues, but now, “owwww!” I tried to think, why now? What had changed? Suddenly it dawned on me, I switched to the Oboz at Kennedy Meadows (~ mile 700), right before I headed into the high Sierra and submerged my feet in snow and icy creeks all day, every day. Now, as I neared 1100 miles, summer was beginning, the temperatures were going up, and my feet were swelling. My shoes weren’t wide enough for my poor feet anymore, and despite my toes efforts to the contrary, the boots were squeezing my feet and pinching/rubbing a nerve. Should I enter the war and come to the aid of my little toes? I could just reach down with my knife and finish what my toes had started… I could cut my boots open and free my toes, but would my boots disintegrate if I did that? I wasn’t sure, so I just kept on walking. Besides, the pain wasn’t excruciating… Yet. Was there another solution? The only one I could think of was to get new boots… I kicked myself for not having thought about that back when I was in South Lake Tahoe… It would have been easy to find boots there. Now it wasn’t so easy… Where was the next place I could get boots to save my toes, or to replace these if they disintegrated? Truckee? Sierra City? Belden? All of the upcoming towns seemed small and unlikely to have outfitters with great shoe selections. Trail Magic to the rescue!!! My friend Peru, who I’d met back in the desert, said she didn’t live far from Truckee and could help me with anything I needed. It’s always nice to see a friend, and as it turned out I did need something… a new pair of boots! I excitedly hiked out to the rest area at I-80 to meet her… The fact that she was bringing ice cream and sodas my have accelerated my pace too… And the idea of *real* food for lunch… I skipped my normal lunch and made it to the rest area full of smiles. Unfortunately, my friend wasn’t there. I called her and we had the “I’m here, but you’re not here,” conversation. Turns out the halfmile app sends you down a 0.25 mile trail to the rest area on the north side of I-80, and she was at the south side rest area. I was getting tired, but figured the was 0.75 mile walk back under the highway to the I-80 PCT Trailhead parking area was no big deal, so I started hiking to the other side. I hadn’t realized that the trail to the south side then added yet another 3/4 mile… Aargh, this was taking longer than I thought! When I finally got there I called my friend and we had the “I’m here, but you’re not here” conversation yet again. I was hot, and tired, and on the verge of tears. Clearly I shouldn’t have waited for lunch or I should have stopped for more snacks. My friend and I were both a bit bewildered because at this point neither of us had any idea where the other person was. Luckily a couple of dayhikers at the trailhead parking had seen me on both sides of the highway and knew my story… They chimed in, “don’t cry, we know exactly where your friend is and we’ll take you there.” I piled all of my stuff into their car and 10 seconds later we were at the south side rest area. How come it wasn’t obvious how to get there from the PCT? 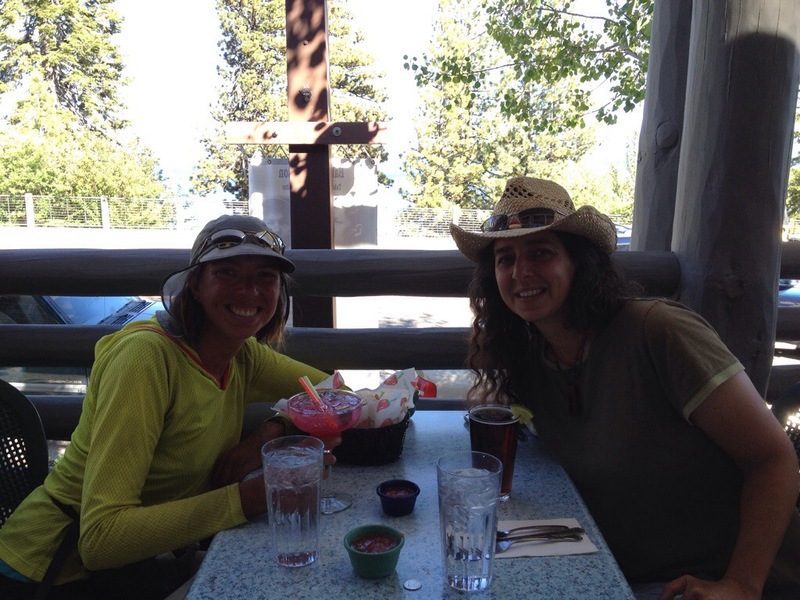 I didn’t know, but it didn’t matter anymore, Peru and I were reunited and we were headed to the Diner in Truckee for food. With our bellies full of food we set off for our next adventure… The hunt for a new pair of shoes. It turned out there was an Outfitters in Truckee, so that seemed like a good place to start. “I’m hiking the PCT, and I’d like to try on the widest pair of shoes that you have in a Men’s size 10.” They didn’t have a huge selection, but he brought out a couple different trail shoes and trail runners for me to try on. They were all way too narrow. I thanked him for his time, but our search was going to have to continue elsewhere. He suggested that we check out a store in Tahoe City called, “Alpenglow Sports” since they had the best shoe selection of any store around there… Especially when it came to trail runners. In a car, the 10 miles to Tahoe City went by in a flash, and before I knew it I was starting the same conversation again, “I’d like to try on the widest shoes you have in a men’s size 10.” They asked me a few questions about what I wanted them for and if I had preferences about their weight and then came back with half a dozen different shoes for me to try on. The three most popular kinds of hiking shoes on the PCT this year seem to be: Merrill Moab Ventillators, Brook’s Cascadias, and Altras. 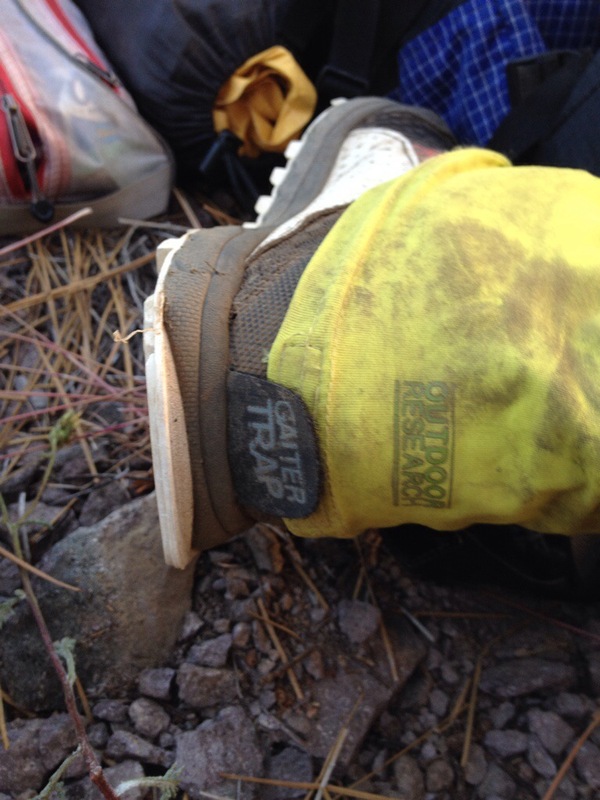 I’d hiked the first 700 miles in Moabs and I knew the men’s size 10 wides would work, but I was hoping to find a lighter weight shoe that was even wider for the rest of the PCT. I tried on the Cascadias, and they were pretty comfortable, but definitely not quite wide enough for my feet (interestingly the Cascadias have a disclaimer specifically about thru-hiking). Just when I thought that I was never going to find a pair of shoes that were wide enough I tried on the Altra Lone Peak’s. They were a little looser in the heel than was ideal, but the toebox was nice and wide… This shoe might actually work! There was just one pair of shoes left to try on, the Patagonia EVERlongs. My first though when I picked them up was that they were incredibly lightweight… They’re only 8.4 ounces. They also felt comfortable and wide enough, but the heel was much looser than the Altra’s heel. I went back and forth between the Altra’s and the Everlongs for a long time trying to decide which ones I liked the best. After almost two hours of trying on shoes at Alpenglow Sports, I eventually settled on the Lone Peak Altra’s. They were wide, they were lightweight, and they were comfortable. The only potential issue was that they were zero drop shoes, which meant that they would be harder on my Achilles’ tendons… Since I’ve had trouble with Achilles tendonitis before I was going to have to be very careful for the first couple of days as my body got used to my new shoes! With any luck my little toes will be happy with the new, more accommodating regime… Since I tend to break-in my new shoes with 20 mile days I’ll find out very quickly whether or not the new shoes will live up to their campaign promises!!! Quick review (4/5): a good, very stable shoe, good traction, and they showed almost no wear and tear after 700 miles of desert walking. I thought these shoes were perfect on the AT, but they felt like overkill on the PCT. For the desert section of the trail I wished I had something lighter weight and more breathable. I also discovered that the giant blisters on my heels were from the way the Moab’s pad just the upper portion of the heel cup and not the lower portion. I repeatably get blisters from the Moab’s at that junction. Switching to the Oboz eliminated that blistering issue. Quick Review (4/5): these are the shoes that I wore through the high Sierra, and they performed well. They were constantly wet (they went for weeks without completely drying), occasionally frozen solid and dealt with both rocky and icy terrain and help up very well. I also used them with microspikes with no problem. They were definitely showing wear and tear across the toebox when I finished with them and it felt like the padding in the sole was shot by the end. Despite all the wetness, they had no delamination issues and held up well. I generally think the traction isn’t as good as the Moab’s, but these shoes gripped the granite of half dome admirably as I went up the cables, so no real complaint there. Their thru-hiker policy remains awesome! My main complaint is that they felt impossibly heavy when wet and were too narrow when my feet swelled. Quick Review (pending): I’ve been hiking in these shoes for 100 miles now, and will give a full review when I trade them out but so far I am loving them. My toes feel free and happy with these shoes (perhaps for the first time in their lives). I’ve been doing extra Achilles stretches and excersizes, but haven’t had any issues with the zero-drop nature of the shoes. Also, I love that thy have a built in gaitor trap. They have much more ventilation than the previous shoes (the downside to that is that my toes get dirtier, even when wearing gaitors). At this point I would consider getting these shoes again when these wear out, which is the highest praise that I can give a pair is shoes. We’ll see what the next 200-300 miles brings! 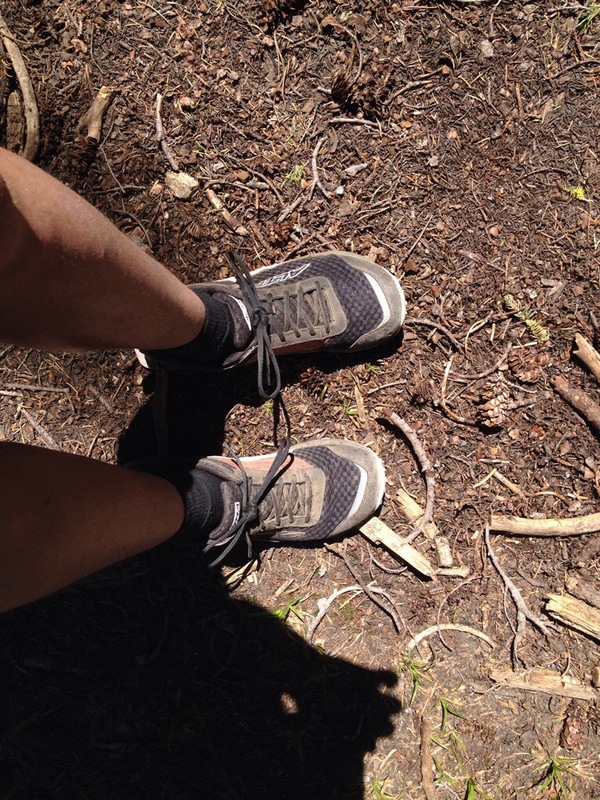 This entry was posted in Gear Reviews, Pacific Crest Trail and tagged alpenglow sports, altra, altra lone peak, brooks cascadia, merrill moab, morton's neuroma, oboz, pacific crest trail, patches, PCT, shoe review, shoes, tahoe city, truckee. Bookmark the permalink. This is a very thorough review full of excellent and useful information. Thank you for taking the time to share!